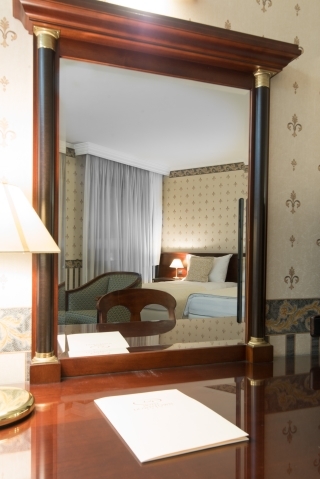 Deluxe suites are a preferred choice due to their generous size and luxury individual touch. They consist of a spacious living area with a sofa, dedicated working area and a cosy separated bedroom. The air-conditioned apartment is facing the inner backyard and features a queen-size bed with deluxe Magniflex mattress, linen and pillows. The 26″ LCD Screen TV offers a variety of satellite and paid channels for watching movies, sport events or news. The soundproof windows guarantee convenience and comfort ideal for a long-term business trip or quality holiday. The sparkling clean bathroom and relaxing bathtub are sure to add an extra touch to the detailed attentiveness we provide our guests with.